At Avenue Advanced Skin Care, we see many clients who suffer from acne and acne scarring. We understand that skin care is not just about improving skin health, but also about enhancing self-confidence. 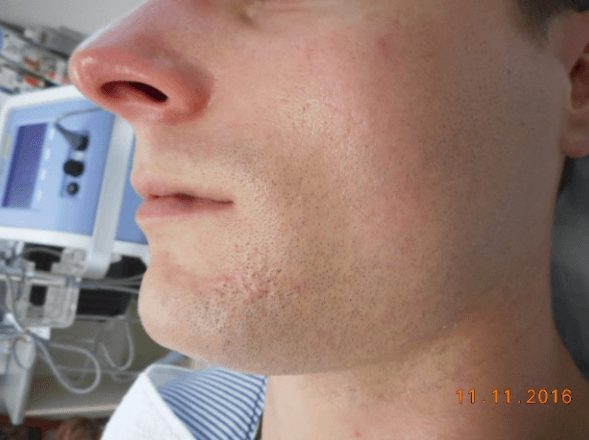 Our team of Dermal Clinicians and Nurse Injectors are extremely passionate and experienced in treating acne scarring. We emphasise the importance of managing active acne before embarking on any treatments to address acne scarring. Ask about how we can help control your breakouts and minimise your risk of scarring. The infection and inflammation associated with acne can cause temporary or permanent scarring on the skin. Acne commonly causes changes to skin pigmentation and skin tone, particularly on olive or darker skin types. Post-inflammatory hyperpigmentation (darkening of skin pigmentation), hypopigmentation (loss of pigmentation), and long term redness of the skin are all common occurrences after an acne lesion has passed. Picking and squeezing active acne can worsen these symptoms. Because each type of acne scar has its own unique set of characteristics, we do not take a one-size-fits-all approach to treatment. Treatment needs to be tailored to the type of scarring present and the amount of downtime that the patient can tolerate. If you’re concerned about acne scarring, contact our Melbourne team today on 1300 230 168. Our Dermal Clinicians and Nurse Injectors will work with you to create a tailored treatment plan that delivers long-term results. In combination with our in-clinic treatments, we strongly recommend that our patients follow a cosmeceutical skin care regime, as devised by our Dermal Clinicians. The tailored skin care program will help to maintain and strengthen treatment results, reduce inflammation, fight bacteria, treat changes in pigmentation, and promote collagen production in the skin, which is essential for skin repair. 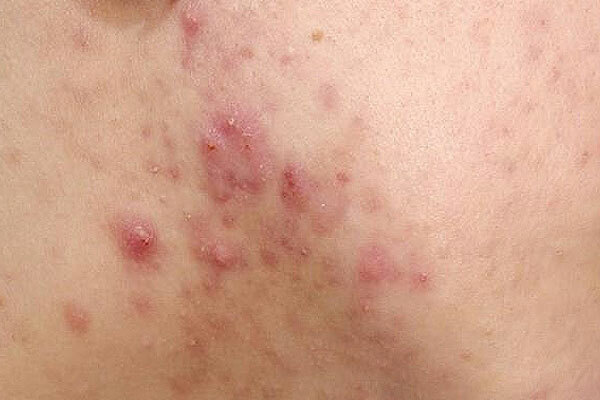 Acne scars are most often the product of an inflamed lesion, such as a papule or pustule. Inflamed acne occurs when the follicle becomes blocked with excess sebum (oil), dead skin cells, and bacteria. The pore swells, causing a break in the follicle wall. Minor lesions usually heal quite quickly, but more serious lesions arise when there is a deep break in the follicle wall. The infected material spills out into the dermis and destroys healthy skin tissue. The skin forms new collagen to repair this damage to the dermis; unfortunately, this quick collagen repair never looks as smooth and clear as before the injury. Scarring is more likely to occur after severe periods of inflammation and deeper breakouts that take a long time to heal. Non-inflamed blemishes such as blackheads and whiteheads typically don’t cause scarring, as they don’t injure the skin tissue. 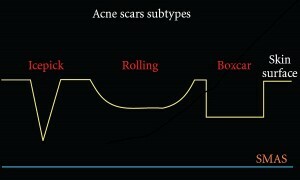 Are all acne scars the same? What types of acne scarring are there? 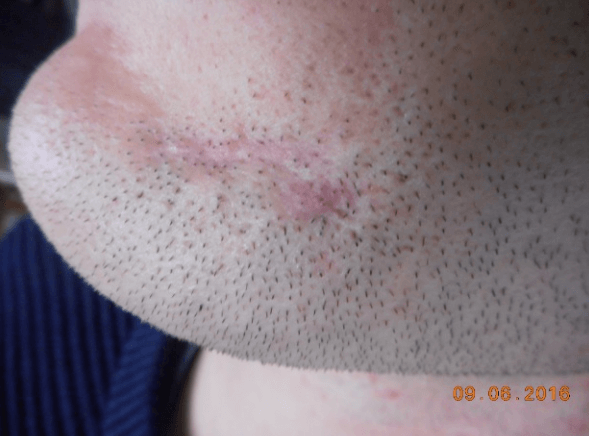 Can I prevent acne scarring if I have acne? To lessen the chance of scarring, try to reduce inflammatory acne as much as possible by seeking treatment as soon as it develops. This may mean consulting with a Dermatologist, Nutritionist and Dermal Clinician. If chronic acne is left untreated, it will almost always result in some form of permanent scarring. A consultation with one of our Dermal Clinicians will help assist you in deciding which treatment will best suit your goals and lifestyle. Generally speaking, the more invasive the treatment, the greater the downtime, and the greater the improvement. The first step is simply contacting us for your initial skin analysis and consultation, where we will discuss with you what is a realistic and achievable outcome, and what to expect from your treatment. How many treatments will I need to change my acne scarring? Most of the treatments we offer require a course of treatments to achieve the best result. The remodelling of the collagen within the skin takes time. Sometimes the best results can be seen between six to 12 months after a course of treatments has been completed. However, our clients usually start to see changes in their skin tone and texture even after a few treatments. Don’t leave the treatment of your acne any longer. Speak with our specialist Melbourne team today on 1300 235 420.